"Shisha" is the flavored tobacco commonly smoked in hookah pipes or Narghiles (Turkish water pipes). Often, shisha is flavored with honey, dried fruits or roses. 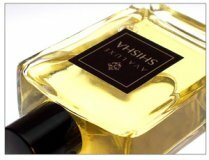 A luminous golden halo of sweet honeyed tobacco and nuances of exotic spice, dried fruits, jasmine, sandalwood, incense, and musk.